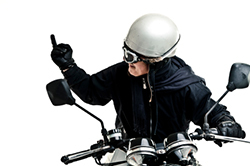 Forty years ago, the “Motor Cycles (Wearing of Helmets) Regulations 1973 (S.I., 1973, No. 180), dated 7th February 1973”, was enacted – the statutory instrument came into operation on 1st June of the same year. On April 5th 1973, the order for this regulation was debated in the House of Commons, with members from either side taking opposite views. Many considered this as a gross infringement of personal liberty. However, during World War II, Dr Hugh Cairns, a consulting neurosurgeon to the British Army, recommended mandatory helmet use for British Service dispatch riders, who carried instructions and battle reports between commanders and the front lines via motorcycles. This recommendation was accepted by the British Army and crash helmets became compulsory for all army motorcyclists on duty from November 1941. Cairns first became concerned about helmet use after treating the war hero T. E. Lawrence—otherwise known as Lawrence of Arabia—for a fatal head injury suffered during a 1935 motorcycle accident. On 31st May 1956, a motion was introduced into the House of Commons “(Helmets to be worn by Drivers and Riders of Motorcycles). After a lengthy debate, this motion was withdrawn. However, six years later in 1962, in the Road Traffic Bill of that year, there was proposed (on Report) a new clause to give the Minister power to make an order such as the one (wearing of helmets), that had been made and was before the House. In the gallery at the House of Commons on that evening in April 1973, were motorcyclists listening carefully to the debate. “I beg to move, That this House takes note of the Motor Cycles (Wearing of Helmets) Regulations 1973 (S.I., 1973, No. 180), dated 7th February 1973, a copy of which was laid before this House on 14th February. Perhaps I should say a word about the form of this motion. It started life as a Prayer against the statutory instrument requiring those riding on motor cycles to wear crash helmets, but before time could be found for it to be debated the 40 days applicable to a Prayer had run out. Accordingly, my motion has been transformed into one to “take note” of this statutory instrument. 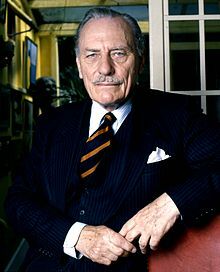 Enoch Powell was noted for his oratorical skills, and for being a maverick. He was a champion of this cause, his powerful intervention in the House of Commons in relation to his opposition to the compulsory wearing of helmets by motorcyclists argued in favour of individual freedom. Although he was not the only MP to oppose this regulation, he was certainly the most eloquent. “We are told, first, that avoidable accidents—and nearly all accidents are in one sense or another avoidable—increase the cost imposed on the National Health Service. That is a fallacy, because the cost is not determined by the demands on the NHS but upon the supply, by what we decide from year to year to spend upon the Service. But then it is said—and the right hon. Member for Vauxhall (Mr. Strauss) said it in a previous debate—that it shifts the resources of the NHS from one sort of case to another. Of course we could enter into endless consideration of the reasons which brought patients to be treated under the NHS—all manner of avoidable accidents, unwise courses of life, unwise behaviour of every kind. Are we to make all these criminal offences because the consequences might be to divert the use of resources inside the NHS? The last and the most beguiling argument—and I imagine it is the argument which operates upon those hon. Members who will reject my argument and that of my hon. and learned Friend the Member for Buckinghamshire, South—is that if this crime is created there will be fewer road casualties from this cause. That is the most alarming argument of all that could be used in this House of Commons: that because by doing so we could reduce the number of deaths from a particular cause—not deaths inflicted by other people’s carelessness, not deaths resulting from the omission of precautions which those who manufacture articles or sell them could have been caused to take, but deaths resulting from private and uniquely personal decisions—therefore we can make it a crime to take that sort of risk. That argument is the most dangerous because it is the most beguiling. When one bastion after another of individual freedom, of independence, is breached, it does not happen in an unpopular context. It does not happen when the reasons for doing so are unattractive. It does so when sentiment and emotion and the feelings of all of us are engaged. None of us likes to contemplate the notion of a young man whose life could have been saved being lost because he was not wearing a crash helmet. Our first natural instinct and reaction, having legislative power in our hands, is to use that legislative power. But that is where the danger lies. The abuse of legislative power by this House is far more serious and more far-reaching in its effects than the loss of individual lives through foolish decisions. I say just that and I repeat that, as a Member of the House of Commons speaking to the House of Commons. The maintenance of the principles of individual freedom and responsibility is more important than the avoidance of the loss of lives through the personal decision of individuals, whether those lives are lost swimming or mountaineering or boating, or riding horseback, or on a motor cycle. We are sent here to make laws and to preserve liberties. If we allow this regulation to stand, we shall have failed in the duties we were sent here to perform”. On March 1st, 1976, in the House of Commons, the Road Traffic (Seat Belt) Bill was debated for a Second Reading (and rejected). “There is one precedent, and only one in the strict sense, for what we are doing, and it is a significant one. I am referring to the legislation enacted under the previous Administration which made it a criminal offence to ride a motor cycle without a crash helmet. I believe that that was the first instance, and this proposition has not been shaken, when it was made a criminal offence (…). That precedent in the matter of wearing safety helmets, which this House by about 55 votes to 15 decided to establish, is now being promptly followed. It is being followed within a matter of two or three years. But this will not be the end. These are by no means the only circumstances in which the failure of individuals to take certain precautions in their private lives entails all manner of risk to themselves and, indirectly, consequences which may be tragic upon others. There is the whole realm of sporting activity, such as mountaineering, boating, and so on, where there are precautions which ought to be taken, and which any sensible person will take. We shall be told presently that these, too, have to be regulated. It will not stop there, because it cannot logically stop there. We shall be told, and rightly, that a man’s habits in life—smoking, the manner in which he conducts his life, indulges himself—affect materially his prospects of survival, as certainly they do. There will, therefore, be increasingly irresistible pressure, once we break through this barrier of principle, to envelop one area of personal decision after another within the criminal law. I believe, therefore, that it is of outstanding importance that, even though this principle has once been breached, it should be reasserted and upheld. I fear I shall not carry the hon. Member for Stoke-on-Trent, South with me on this, but I should not fear to accept the loss of life which might otherwise, by the breaching of that principle, have been avoided. As I said in the debate on the wearing of crash helmets, many lives have been laid down, and are laid down, in order to maintain the essentials of personal liberty in a society living under the law. Nevertheless, we ought in this debate not to be carried away with the projections and predictions of the Minister. In this context—I am not straying on to the merits—it is instructive to look back at what we were told on the first occasion when we breached this principle—in the matter of safety helmets. The then Minister said: Our estimate”— that is the estimate of the Minister’s predecessors— taking all these figures into account”— that is taking into account the proportion of people who were already wearing crash helmets— and bearing in mind that there are no longer people of 16 years of age riding the larger motor cycles, is that some 300 to 400 deaths and serious injuries would be saved each year. One half of these casualties would involve teenagers.”—[Official Report, 5th April 1973; Vol. 854, c. 771.] It was under that advice, under the impression that the number involved was 300 or 400 a year, that hon. Members, in a thin House, decided in favour of the crash helmet legislation. We can now apply a fairly rigorous test to the fulfilment of that prediction. On 29th November 1974, the Minister’s predecessor gave me the comparison between motor cycle casualties—deaths and serious injuries—in the 12 months before and the 12 months immediately after the wearing of crash helmets became compulsory. It is here that one has about as straight a comparison as one could hope to get, if one bears in mind the growth of traffic and the estimate, which was stated in the answer to my Question, that the number of motor cycle riders rose between those two years by 12 per cent. Having noted that, we can make the comparison of the outcome with the prediction. The number of deaths, all ages, for the year before was 505; for the year after, the figure was 506. Of those under 20 years of age, the figure for the year before was 236, while for the year after it was 235. Let us consider the number seriously injured. The number of seriously injured, all ages, was up by 12’3 per cent., while for those under 20 the figure was up by 24 per cent. comparing the year after with the year before. If one takes both figures together, which I think is statistically objectionable, for the statistic of death is a statistic of a different category from the statistic of serious injury, one finds that the number of killed and seriously injured together was up by 11.6 per cent. In other words, so far as one can judge the matter at all by the out-turn, the legislation had no effect whatever upon deaths and serious injury among those riding motor cycles. If it be said, however, that there is significance in the fact that the number of deaths remained static instead of rising by 12 per cent., and if we suppose that that effect was due solely to the wearing of crash helmets—which I think is clearly an extreme assumption—the number of deaths and serious injuries saved in a year was not 300 to 400, but 40. So, with the best will in the world, the calculations which were genuinely intended to give the best possible guidance to the House, the advice which we were offered when we decided to establish this precedent, have turned out to be repudiated and refuted by the outcome, however generously interpreted. I hear someone ask whether 40 lives are not worth saving. Of course they are; but I want to know what I am losing at the same time. If, to delay those 40 deaths, I have to assent to a proposition being established which can be applied successively in one area after another of personal behaviour, then I say, as hon. Members in this House and in generations gone by have said, that in the end the principle is what we are here to uphold, and we must not be distracted by the appeal to figures of casualties looked at in isolation. I do not rest upon the statistics, though my own belief is that the estimates which the Minister with entirely proper intentions and entirely sincerely has been advised to give will probably be found to be grossly exaggerated. As legislators we are here considering what will be the cost in the future of legislation which makes it a criminal offence for a person to endanger himself in circumstances in which thereby he directly endangers no other person whatsoever. That is something which I believe the Legislature should not do”. “In battle time the Sikh has never been called upon to discard his turban in favour of the war hat or tin helmet worn by other soldiers under battle fire. It has been known for bullets to lodge in the hair of Sikhs. No one would care if at that time a Sikh was not wearing a tin hat. So far as I know, right up to the present time the long hair and turban are freely accepted in the three branches of the British Armed Services. I cannot imagine that the true Sikh is ever told that his services are no longer required in any shape or form. As citizens of the Commonwealth, many Sikhs from the middle 1950s onwards have come to the United Kingdom. They are hard working and are winning their way in British society. In the past, because of native prejudice and misunderstanding, they have had to struggle for the right to wear the turban, particularly at work. We have overcome objections to the right to wear long hair and the turban, notably in transport in the Midlands and in London. Some factory cases have been fought and overcome. Uniformed caps and helmets are not enforced against the Sikh’s religious belief”. In November 1976, Her Majesty the Queen gave her Royal Assent to a Bill to exempt turbanned Sikhs from having to wear crash-helmets when riding a motor-cycle: The motorcycle Crash-Helmets (Religious Exemption) Act, 1976. The consequence of this exemption was that one man, Fred Hill was to provide impetus to the recently formed Motorcycle Action Group (MAG UK) to call for the helmet law to be rescinded. Fred Hill was born in Yorkshire and spent the war as a dispatch rider before becoming a Mathematics teacher after the war. Ian Mutch now President for life of MAG UK wrote about Fred Hill and explained his reasons for refusing to wear a helmet and the price this “freedom fighter” paid. 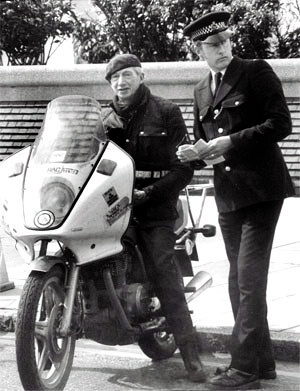 “(…) Fred’s involvement with MAG and the anti helmet law campaign began in 1976 after the Sikhs gained and exemption from the law. There were those at the time who were uncertain about Fred’s motivation, fearing that it might be racist, born of the resentment that an immigrant minority were enjoying preferential treatment. Those who met Fred, heard his speeches, and got to know him a little, were re-assured that this was not the case. If Sikhs did not have to wear helmets then nobody should have to although he rarely ever made any reference to the Sikhs’ preferential treatment. While Fred’s personal campaign was passive, it was absolute, in that Fred never wore a helmet and never paid a fine. 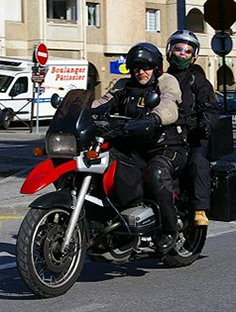 In consequence, huge number of summonses began falling through his letter box, when a journalist from the motorcycle press went to interview him in his home in Hayes, Middlesex. Fred produced a sizeable suitcase packed with summonses that he kept as souvenirs, all unpaid. It was his refusal to pay the fines, rather than the helmetless riding offence, that led the courts to imprison Fred, the charge being the more serious one of “Contempt of Court”. Although he was always polite to the authorities that pursued and imprisoned him, Fred was totally unimpressed by people in high positions, and was never intimidated by them. On one occasion a woman magistrate was endeavouring to chastise Fred for breaking the law, to which criticism, Fred, implicitly referring to Emily Pankhurst and the female emancipation movement, replied, “if it hadn’t been for a woman breaking the law, you wouldn’t be sitting there now madam”. Fred was sentenced to a total of 31 prison sentences over the eight year course of his campaign, sometimes for as little as twenty-four hours, rising to a maximum of two months, his final spell which he half completed in London’s Notorious Pentonville prison”. Forty years on, all riders (except Sikhs) are required to wear a helmet while riding a motorcycle in the UK and in fact in most countries throughout the world. Generally it is accepted that in a crash scenario helmets help to prevent injuries. 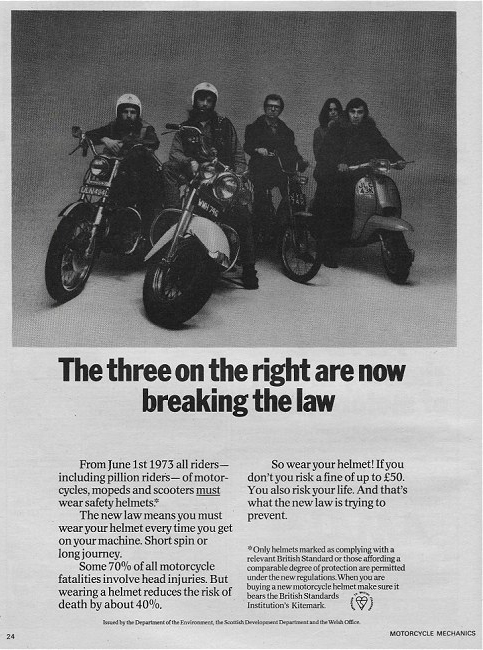 Few people of principle remain from those days in 1973 when the imposition of mandatory helmet use was felt to be unnecessary because the vast majority (88%) of motorcyclists wore helmets anyway and it was felt that this was an abuse of legislative power and removed the freedom of liberties. 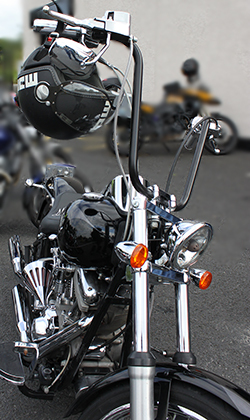 The introduction of the helmet law in the UK was a defining moment for motorcycling because it established precedence for “safety” legislation for this form of transport. The latest of which has recently (2012) been enacted into law via the European parliament through the requirement for ABS brakes and mandatory headlights for these vehicles. “(…) the principle of MAG’s objection to the helmet law is not an umbilical attachment, but a philosophy that underpins MAG’s existence. Thus, every action we have taken, every action we should take, centres around this one fundamental principle. It’s not about whether you wear a helmet or in fact any form of protection, it’s about whether you choose to do so. It’s a way of life that I share with my friends and fellow riders. The culture of safety and security eats away at everything we do and dinosaurs like myself, find it harder to explain that each of us must stand up and be counted. Helmets, protective clothing, leg protectors, electronic safety devices may or may not save us. Our wits and God’s favour might. But in the end, we must have the right to live our lives as we see fit, respecting our fellow man, but in freedom”. If u have a motorcycle helmets with a stone chip on it is it still safe to wear? That is a question that is really hard to answer without seing the helmet but mainly because we are not experts on helmet damage.. However how would you know that the structure of the helmet has not been affected. The best advice would be to take the helmet back to were you bought it, they hopefully will be able to advise you as independently as possible (don’t just see a new helmet sale) or contact the manufacturers. What happens if I drop my helmet? The damage a helmet may sustain depends on the surface it comes into contact with; a smooth concrete floor may cause only minor cosmetic damage whereas a tarmac road with a protruding stone may cause some damage to the outer shell. Always get the helmet checked. Sorry we can’t be anymore helpful. Hi can anyone help re regulations and kitemarks for helmet safety in the UK? I have found the helmet that is perfect for me, but I can only find it online from USA suppliers. I have tried the UK equivilent on for size and fit – but the UK does not seem to stock the updated version I am after. In the USA the helmet is DOT qualified and it says ECE (in Europe) qualified (I’m not sure what either of these mean), but in the UK the below rules apply. Does this helmet qualify for the below? And if it does not bear the UK required kitemarks is it legal in the UK and will it affect/void insurance if it does not carry the marks? It would appear that the helmet as sold in the USA must pass their standards which is the DOT standard. This is the mandatory U.S.government standard that all motorcycle helmets must meet to be legal for sale and for road use . Then there is Snell testing which some say is more stringent than the DOT tests. Snell and ECE are entirely optional. Some helmets just meet the DOT, legal requirement, other manufacturers add Snell or ECE and some helmets will pass all three standards. In the UK a helmet sold can also carry the ACU gold sticker. This not mandatory, all helmets don’t require an ACU sticker, it relates to the use of the crash helmet in sport – the gold sticker indicating helmets which are authorised for use in racing. We believe you may also require this on a helment used on a track day? However most helmets nowadays will only have the 22.05 regulation requirements as this is one of the requirements so it is not necessary for the helmet to have a BSI Kitemark as well. So if the helmet meets the UNECE 22.05 regulation, check with the seller of the helmet that it does or contact the manufacturer that the helmet as sold in the US meets the 22.05 regulation for use in the UK. It is good that you have tried the helmet on for size and fit and although it is a buyers market out there the UK dealers have lost a sale in this recession. Also have you checked that you will not be due to pay tax or duty on top of the advertised purchase price, thus negating any savings. You will not know anything about this until you get a notice from the Post Office to come and collect your package and you owe some money. We would say that if the helmet is not legal in the UK then it will affect/void your insurance, in respect of that is when the insurance company finds out. This will most likely happen when you need your insurance most, in the event of a collision and injury. Oh how I would like to ride down a local hill without a helmet with the wind thru my hair and the feel that sheer exhilarating thrill again. Would I be allowed to ride down in this fashion on private land???? As for public roads, however much I may dream I think of all those riders saved head injury because they wore a helmet. Therefore, the religious exemption not to do so is very unfair and illogical allowed by those in sheer ignorance of such religions and for votes. If only Enoch Powell, pontificating on personal freedoms had a child who had such an accident and died of head injuries, or suffered one himself what would he say then? Now we have manic 200mph riders using public roads as race tracks. Common sense & Safety sacrificed for Freedom etc. Freedom for whom? Why do we burdened taxpayers with our NHS struggling to survive have to pay for all the dreadful injuries of these champions of FREEDOM when they suffer such injury? All those battling for religious scruples simply take all of us for a ride. The Sikhs have 5 symbolic articles they have to wear. One is a small symbolic dagger. Could they carry a real one on a plane? or in the streets. They dont, instead they carry a small symbolic one. They also have a Patka a smaller turban just as good over which a hemet can be worn and I understand the bigger article is not strictly necessary? What about insurance? Apparently one English MP fought for the right of Sikhs not to wear helmets in War as they had fought before without them. So let them do as they please. but in case of head injuries we should NOT have to pay for their scruples, religious or not. Let those who do pay for all the expensive and life long injuries they may suffer. Of course they wont, we dumbos do. We should not have to bear this exemption to throw caution to the winds for scruples. This is simply the right to blatantly flout safety laws due to religious extremism. This is the same for the Niqab face veil. Recently 2 persons dressed in Burkas and Niqabs(face veil) robbed Selfridges in London. Took out axes smashed glass cases while Security guards looked on and stole £100sK of watches. A terrorist in custody scarpered wearing a Burkha, Security cameras, useless as with Hoodies we walk in fear of. The Koran only requires women to be modest!!! When in Rome,I would not be allowed to wear a bikini on a Mid East beach nor kiss etc etc nor even celebrate X’mas publicly. We the majority with common sense in this country should not have to suffer such .It is our M.P’s currying favour for votes and in ignorance of these religions that have allowed such a state of anarchy.Safety should override any scruple or religion. Taken so far,now. such grovelling to ban X’mas decorations etc. Enough is Enough We are very tired of paying for radicalism, we should have the FREEDOM to refuse to pay for it. They should bear the cost. Are Rastas and Christian Nuns exempt too? If you see someone with veil flying freely behind. It will be me. If you cannot obey our safety laws you know what to do that goes for everyone religious or not. I’m sorry you lost me. Are you a cupboard racist or have you been drinking lots of wine? The article was simply explaining the history of the helmet law. Enoch Powell with all his faults (don’t we all have them?) was eloquent in Parliament back in 1972 in explaining why as a nation, we have a fundamental right to freedom – including that of being reckless and possibly injuring ourselves as a consequence. Your argument regarding religion is incomprehensible and seems to suggest that you have major problems with Sikhs and Muslim women wearing the Burka etc. You suggest that when in Rome you could not wear a bikini – clearly you have not been in Rome…. I do think that there might be a good chance of having your arse felt because any healthy Roman would do that to a woman wearing a bikini. I suspect that the Vatican would not let you through the front door of St Peters, but then I wouldn’t let you through the front door of my house. Ultimately it’s a helmet for Chrissake – that’s all – no big deal. If you are so obsessed with wanting to live in a society that does not wear helmets – then go to the US. They have many states that allow it and also allow nutters to carry guns. If you believe that our society should be driven by Health and Safety – well – that is your opinion, you are entitled to it. Thankfully not all of us share it. If the safety argument is carried to its logical conclusion, it should therefore be made illegal to ride a motorcycle or drive a car, since these vehicles are responsible for a lot of deaths and injuries every year. Similarly, the pursuit of any ‘dangerous’ passtime should also be made a crime; eg rockclimbing, parasailing, parachuting, sailing… boating in general, swimming. In fact we shouldn’t be allowed to do anything remotely dangerous and anything dangerous should be made into a criminal offence. The above still only deals with minority issues. There are much bigger problems we need to tackle. Wars, poverty, starvation account for many more deaths and much more life-long mutilation than ‘safety legislation’. How should we legislate against oil/energy/resources greed that is at the root of this? The fine is only £30. I would willingly pay £30 to have a sunny day of freedom riding my bike without a lid, in jeans and a shirt. In fact I will, and if I am not seen then that is a free day of freedom. If all bikers said no to this law then it would be unworkable. The reason we do not protest too strongly is that most choose to wear a lid anyway. That being the case, why have the law. Allow freedom of choice for a change.. In August 2013 in GB the the £30 non-endorseable – no points endorsed on your – FPN (Fixed Penalty Notice) went up from £30 to £50. Here in Northern Ireland it is still £30 and a non-endorseable offence. 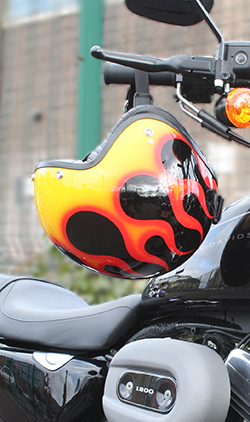 As the “law” says – You must wear a safety helmet that meets British safety standards when riding a motorcycle or moped on the road. How many times would you be willing to pay the £50/£30 fine? Would you end up not paying the fines as a matter of princple and go to jail? Would you defend yourself when they come after you as a habitual offender? Would you be the new freedom fighter for MAG’s stance on the helmet law? The day it all began after the good fight was fought and lost but principles not surrendered! I personally think helmets save lives.I choose to wear one for protection, but at the same time I think adults should be able to decide for themselves. If the law changes I’ll still be wearing mine.